Mijas Golf, 3 bedroom villa with private pool for holiday and long term winter rental, minutes from La Cala de Mijas & Fuengirola. Very private and very quiet, our villa, Casita Buganvilla is an absolute haven. The villa overlooks the 2nd tee of the "Los Lagos" course at Mijas golf. You will never want to leave. 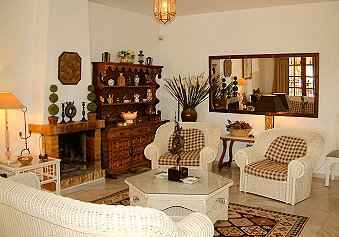 The villa has a spacious living/dining area with open fire place. It opens via two sets of French windows onto a covered patio. The patio is furnished with an additional dining table and chairs for outside eating. This is in keeping with the seamless indoor / outdoor lifestyle of the Costa del Sol. There is also a Barbecue on the terrace. All three bedrooms (two doubles and 1 with 2 beds) are well appointed with built in wardrobes and serviced by two bathrooms with baths/showers. Set against a backdrop of the magnificent Los Lagos golf course, the gardens are a delight. Completely established and well maintained. There are avacado, lemon and pomegranate, palm trees and cactus plus a variety of flowering shrubs including hibiscus, buganvilla and so many perfumed Mediterranean flowers. The swimming pool area, which directly overlooks the golf couse, has a tiled surround and there are comfortable sun loungers making this the ideal place to curl up with a book. There is a large garage with further sun terrace above and additional car parking area. The Villa has the benefit of Internet access and English language TV. Most properties no longer receive English television in Spain. Prices charged are in UK Pounds. 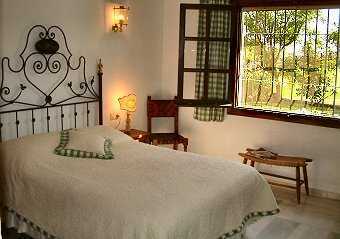 Casita Buganvilla is in a quiet position with the Mijas mountains behind. 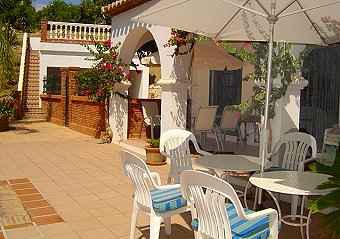 The villa has easy access to local amenities in Fuengirola 2 miles away. It is midway between Malaga Airport and Marbella, both about 20 minutes by car. 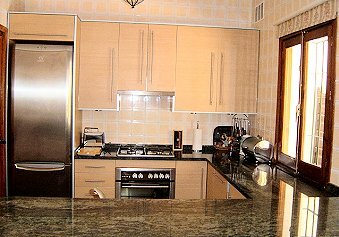 This part of Spain has lovely beaches and is a short drive to the ports of Benalmadena, Cabopino and Puerto Banus, all with exclusive shops, restaurants and excellent nightlife. The luxurious 5 star Byblos Hotel is 5 minutes walk from the villa and offers spa facilities. Other local amenities include a water park, zoo, sailing and fishing trips as well as horse riding, tennis, golf, all water sports, and cable car. We are only 10 minutes from the Costa del Sol Horse racing track - also the venue for summer concerts which have included Elton John, Bryan Adams and Rod Stewart. Lots of outdoor space, both covered and uncovered.